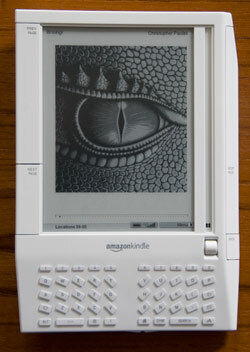 After months of contemplation, I finally ordered Amazon's hot new product, the Kindle. And at the moment, I'm impressed. For those of you who don't know, the Kindle is an electronic book, enabling you to download books and read them on an easily-read screen. It promises savings (downloaded books usually cost $9.99 as opposed to the $20+ costs on Amazon), ease of reading, paper savings, and the ability to stay up to date with the world through daily downloads of newspapers and magazines. And, while it's not yet perfected, it delivers on the above. Size: 7.5" high, 5.25" wide, and just 0.5" thick. Screen size: 4.75" x 3.5" which may seem small, but since you can easily adjust type size, it really doesn't matter. The screen is white with black print, and is specifically designed so that you can read it even under the bright glaze of sunlight. However, this also means that you need light to read, so if you're reading in bed, you'll still need a light to see the page, just like a normal book. Which brings up their download capabaility. Kindle uses its own cellphone connection (no, it doesn't cost any more) to regularly contact Amazon's servers and download new books, newspapers, etc. This service also allows you to buy books online, which are then automatically downloaded to your Kindle. 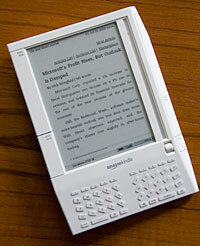 You can also "Kindleize" your own documents (reports from work, letters from your kids, family histories, etc.) by emailing the file to a certain address. Amazon then, for a small fee (currently $0.10 per emailed document) turns them into a Kindle document and uploads them to your Kindle. Amazon also archives all of your purchases, so that you can redownload them later in case it's needed, giving you the ability to remove books not currently being read in order to make more room for new ones if you're memory's full. That memory, by the way, can also be augmented by adding an SD card to the system. Oh, and I have to mention, as a marketer, I love the book-inspired packaging! Reading a book is simple and intuitive. You select the book from your home page using the rollerball on the bottom right corner. 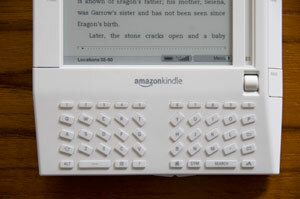 When it comes time to turn the page, you simply click one of the long buttons on the side of the Kindle, which enable you to go to the next or previous page. If you're like me and always have several different books in the reading process, Kindle remembers where you were and automatically takes you to that spot when you return to that book. It also contains a number of other nice features like bookmarks, the ability to add annotations and copy certain pages into your clippings library (nice for keeping track of important passages), a search function, the ability to change size of print, so you don't have to fumble around for your reading glasses if you've reached that point in life :<). It comes with a Kindle Users Guide (note to Amazon - it's too long. You need a 5 page Getting Started Guide, with a separate complete users guide,) that walks you through all of the functions of the tool. I know, I'm an electronics guy too and never read instruction manuals, but the first 15 pages or so are worthwhile reading. It's also easy to go, at any point, at any point, to Amazon.com's Kindle page to buy new books for your collection. You may have to log into Amazon from a regular computer first to authorize one-click ordering and set up the process, but that only took a few seconds. Since I read when eating lunch, I no longer have to have something to hold my book open on the table! Now that's cool! Too slow - I don't know what processor's in this, but it's feeling like a screaming 8088. Computers are supposed to be fast, especially when they are specially designed for a specific purpose. For example, why is it not preloading the next page into graphics, so that it's instantly available when I press Next Page? I'm not talking about downloads here (which I was actually surprised happened so quickly,) I'm talking about responsiveness of the unit itself. Another example, why does it take so long to recreate the home page? No real mouse - the scroll bar only moves up and down, not left to right. So, when annotating or adding pages to your clipboard, you're adding whole sections of text, because there's no way to block specific words or sections left to right. Come on Amazon, it's almost 2009, that technology's been around for a very long time! 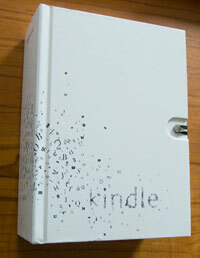 And hey, if you don't like it, slap it up on eBay, where Kindles are currently going for prices close to retail. So you haven't got much to lose! Overall, I credit Amazon for making a great first shot into this space that's been long overdue for a major player. It's got strengths, and weaknesses that should be resolved in future iterations. But for anyone who's a book lover, a reader of major newspapers or magazines, or has backpacks and bookshelves that overflow with books, this is definitely worth considering.